Vision correction surgery has made it possible for millions of people all over the world to reduce their dependence on glasses and contact lenses and see clearly at a range of distances. In fact, many people have been able to throw away their corrective eyewear altogether because of these advanced treatments. At Riverside EyeCare Professionals, board-certified ophthalmologists—Dr. Michael Sumsion and Dr. Sean Sumsion—offer a number of state-of-the-art laser vision correction and intraocular lens implant procedures designed to significantly improve the way you see. These treatments can help individuals suffering from a number of vision conditions, including nearsightedness, farsightedness, and astigmatism. Our surgeons have been performing these procedures for many years and have helped patients from areas all over the country improve their vision with successful results. Incredible support staff and excellent doctors. My mother has been seeing Dr. Sumsion for many years and he has corrected her issues and she is doing fantastic. Thank you all for the excellent service. The following links will take you to more detailed descriptions of our vision correction procedures. If you would like more information, or if you would like to schedule a consultation here at our practice, please contact Riverside EyeCare Professionals today. One of the most frequently performed laser vision correction procedures available, LASIK uses laser energy to reshape the cornea and allow for a sharper focus on objects at near or far distances. LASIK can also help patients suffering from astigmatism. This innovative treatment can significantly improve your vision and reduce or eliminate your reliance on eyeglasses and contact lenses. 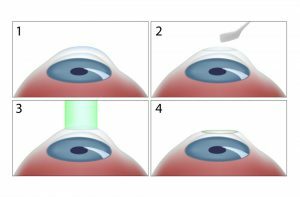 PRK, or photorefractive keratectomy, offers many of the same benefits as LASIK and can serve as an alternative for patients who may not be candidates for LASIK. This treatment also utilizes a laser to reshape the cornea for better vision. Patients with corneas that are too thin for LASIK may qualify for PRK vision correction. Refractive Lens Exchange involves the replacement of the eye’s natural lens with an artificial lens implant. Often used in cataract surgeries, Refractive Lens Exchange procedures can also benefit patients who are not candidates for laser vision correction. Advanced intraocular lens implants can improve a variety of vision conditions to help you focus more clearly on near or far objects without heavy dependence on corrective eyewear. If you would like more information on the many procedures we offer, or if you would like to schedule a consultation with one of our ophthalmologists, please contact Riverside EyeCare Professionals today.